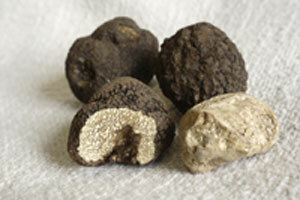 Truffles resemble knobbly tubers and have a very pungent smell. Truffles are essentially mushrooms that grow underground in association with certain types of trees, mainly oak, beech and hazelnut. The truffle develops over several months and only when a number of conditions are right, such as the acidity of the ground, surrounding vegetation, temperature and rainfall, will a truffle grow. 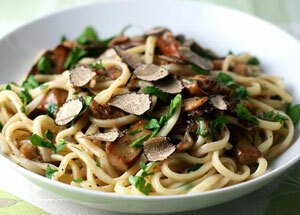 Truffle gathering remains an ancient and secretive art, practised by a select few. Even in years when conditions are quite perfect, only very small quantities are unearthed. It is this rarity that accounts for the high prices truffles command. The truffle has developed its very powerful aroma in order to propagate – it is very attractive to animals such as pigs and squirrels which dig them up for food and then go on to disseminate the spores. Female pigs or trained dogs have long been indispensable in finding truffles. Originally truffles were hunted with female pigs as it was thought that the scent from the truffles resembled that of the male pig pheromone. Nowadays truffles are hunted with trained dogs. 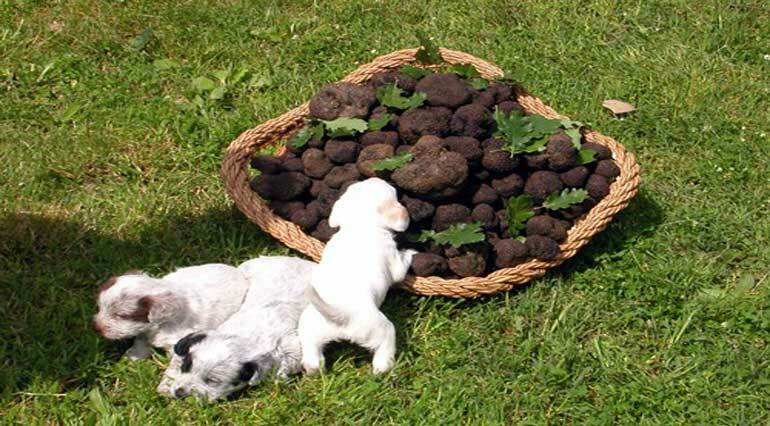 The dogs are trained from a young age with pieces of strong smelling cheese which are buried and the dogs sent to find them, eventually small truffles are buried for the dogs to find. Alternatively it is possible to send a promising dog to truffle hunting school, in all it takes around four years for a dog to become fully trained. A good hunting dog is invaluable, and each year there are reports of experienced hunting dogs being poisoned by rival hunters. 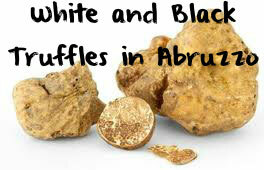 The White truffle grows in center and northern Italy, as well as in Abruzzo region. White truffles are rarer, more pungent and more expensive than black ones. They have a shorter growing season, in the three months around Christmas. 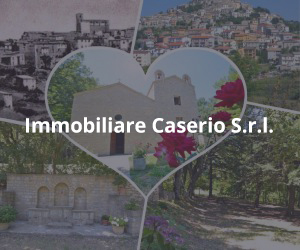 Blacks are more common in the centre and south of Italy. The white truffle market in Abruzzo is busiest in the months of October and November. Cook the beans for 5 minutes in a pot of boiling water, drain. Cover with cold water, add salt, return to gentle boil, and cook til nearly tender, about 45 minutes. Meanwhile, grate 2/3 of the truffles. 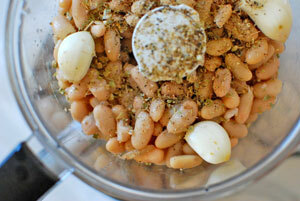 Drain the beans, reserving half of the cooking water. Add the olive oil, grated truffles, pancetta, and pepper. Cook 10 minutes, or until tender. Slice the remaining truffles with a truffle slicer. Serve the beans hot, garnished with the truffle slices. Serves 4. • Pinch of Parsley, minced. Drop fettucine in a large pot of boiling salted water. While pasta is cooking, combine all ingredients except parsley and mix in a bowl. Drain pasta and toss with mixed bowl ingredients. Empty bowl into four large, hot pasta bowls using a pasta fork to spin fettucine into the center of each plate. Top pasta with shaved cheese and sprinkle with minced parsley. To truly make this a special dish, shave fresh white truffles before serving. Extra virgin olive oils D.O.P.